Shop Knowledge center Crop rotation How do you choose the right tomato hooks? How do you choose the right tomato hooks? Tomato hooks are an important part of the crop rotation process. In many vegetable crops, the hooks are used to bring the crop to the optimum working height and to be able to tie up young plants more quickly. The tomato hooks can be supplied in different sizes, with different types of rope. In this article, our specialist will help you choose the right tomato hooks for your growing situation. 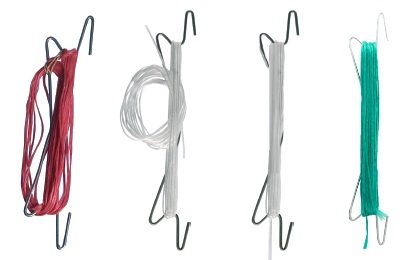 The V-Hook has two storages of rope: the first storage is located on the tomato hook and the length of the second storage can be determined by yourself and is bound by a rubber band. When hanging the hook the rubber band is being loosened which triggers the fall of the rope. This free fall is accurately measured with an accuracy of 5 cm. The O-Hook also has two storages with a self-determinated free fall. With the O-Hook the free fall is not triggered by loosing the rubber band, but the rope is wrapped like an O through the storage. When hanging this hook the O-wrapped rope will fall with a single hand movement. This free fall is accurately measured with also an accuracy of 5 cm. The Easy Hook is a tomato hook with a bundle rope which sits together like a ponytail. These tomato hooks are available with or without a free fall. At the same time these tomato hooks can be recycled. The hook will be returned to the manufacturer. When arrived the hook will be cleaned, disinfected and galvanized to make it reusable. The HD-Hook is a tomato hook with a single rope storage. These tomato hooks don't feature a free fall. These hooks will be hanged between other hooks in front of an extra stem, with a limited rope length to the extra stem. The whole rope is wrapped around the the hook and has to be unwound by hand to get the wanted rope length. The 180 mm version is being used in relatively low greenhouses or in slow growing crops. The 220 mm version is being used in higher greenhouses, cucumbers and other fast growing crops. In case you need tomato hooks with free fall, you can decide yourself the length of the bundle and the length of the free fall. The free fall of a tomato hook is measured for all types and sizes from the top of the hook. Besides the different sizes, there are also different types of twine that can be wrapped on the high wire hook. The choice of a certain type of twine depends on the crop. If you prefer customized advice, you can also use our tomato hook configurator. Fill in your details here and you will receive advice from our specialist within 24 hours. The tomato hooks are produced abroad. In order to make transport as cheap as possible, the hooks are packed as efficiently as possible. Please take this into account when ordering the tomato hooks, so that you're sure that you are ordering enough hooks. Royal Brinkman offers to send a free sample for a selection of our products for our customers. A free product sample enables you to check whether the products fits your needs before deciding to buy it. The product samples are free to try out and a purchase is not required. Do have any questions about tomato hooks? Do you have any questions about tomato hooks, or do you want personal advice? Contact our productspecialist Crop rotation Martin Meuldijk, or use the form below. When you ask a question or request personal advice, we'll contact you within 24 hours on working days.